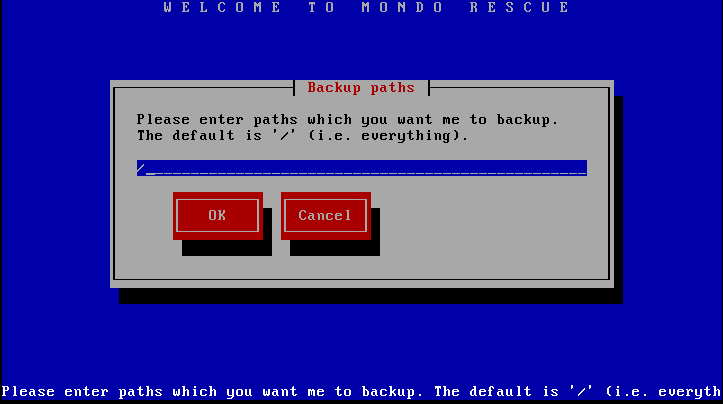 Mondo is a GPL disaster recovery solution to create backup media (CD, DVD, tape, network images) that can be used to redeploy the damaged system, as well as deploy similar or less similar systems. In the event of catastrophic data loss, you will be able to restore all of your data [or as much as you want], from bare metal if necessary. Mondo is in use by Lockheed-Martin, Nortel Networks, Siemens, HP, IBM, NASA’s JPL, the US Dept of Agriculture, dozens of smaller companies, and tens of thousands of users. 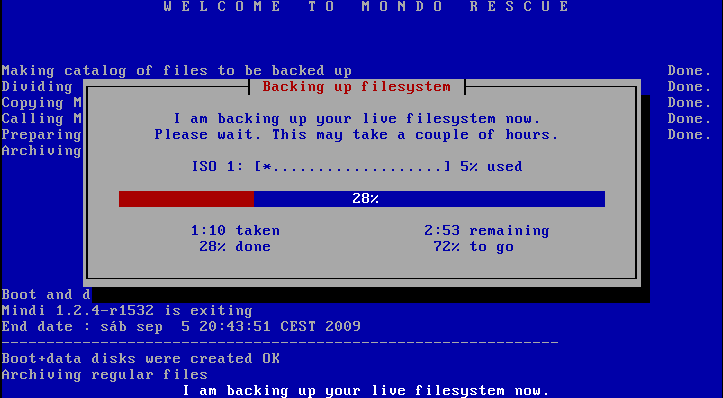 The backup media is created while the system is up and running. Those coming from an HP-UX background may liken MondoRescue to Ignite-UX. 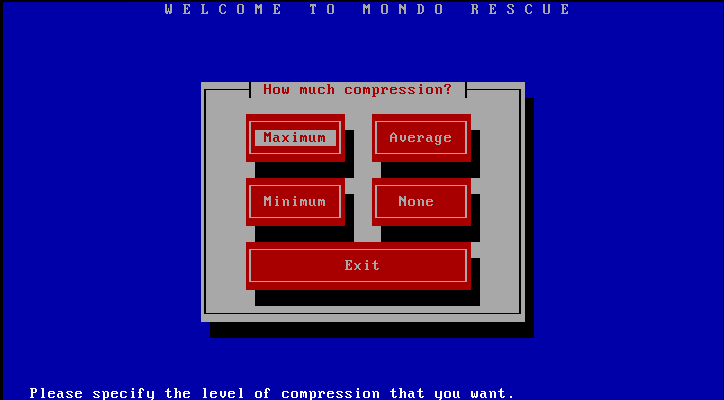 Mondo is available from the RPMForge repository. Fedora Core 4, Core 5, Core 6, 7, 8, 9, 10 . 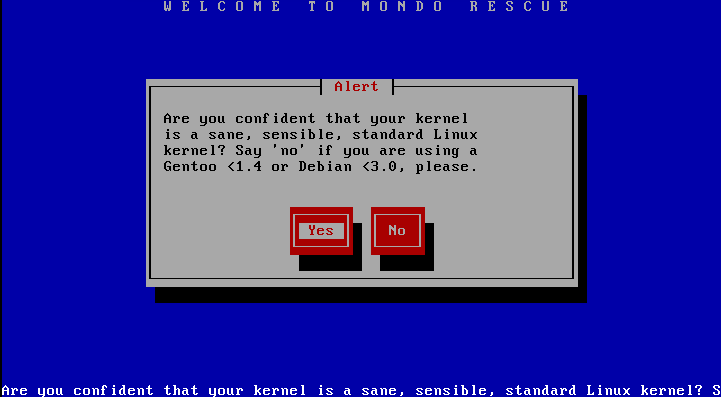 RedHat Enterprise Linux 2.1, 3, 4, 5. OpenSuSE 10.0, 10.1, 10.2, 10.3, 11.0, 11.1. Look also at this web page for SuSE details. Packman may have some useful additional packages. SuSE Linux Enterprise Server 9, 10. Debian 3.1, 4.0, 5.0. Look also at this web page for Debian details. Ubuntu 6.04, 7.04, 7.10, 8.04, 8.10. Older packages are also on the ftp site to help for some old fashion distros/versions. 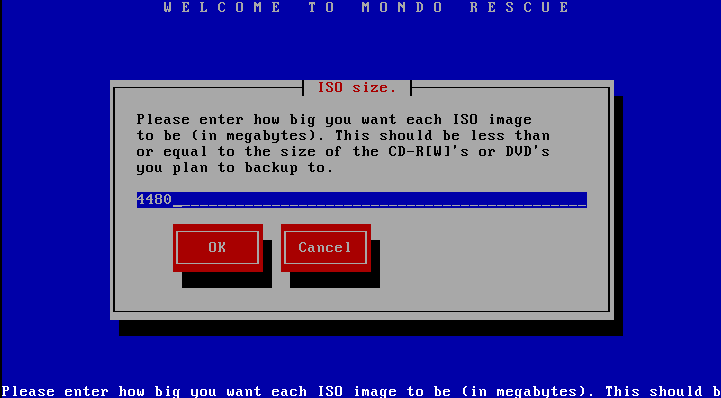 Now we have an ISO image that can be burnt into a DVD. 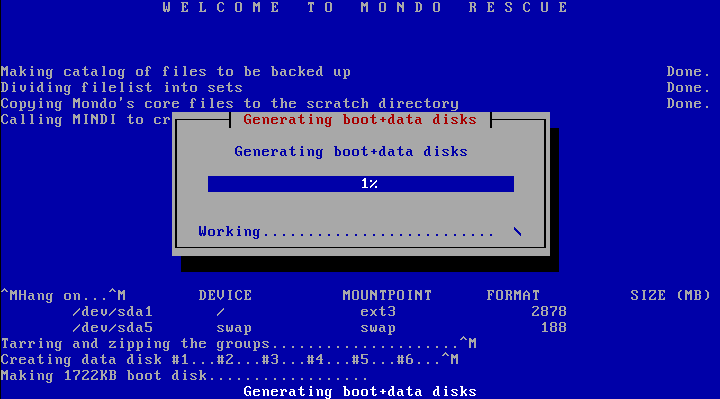 Our system can be easily redeployed or restored by booting from this DVD. To format and restore all files automatically type “nuke” <ENTER> at the boot prompt (bare-metal recovery). 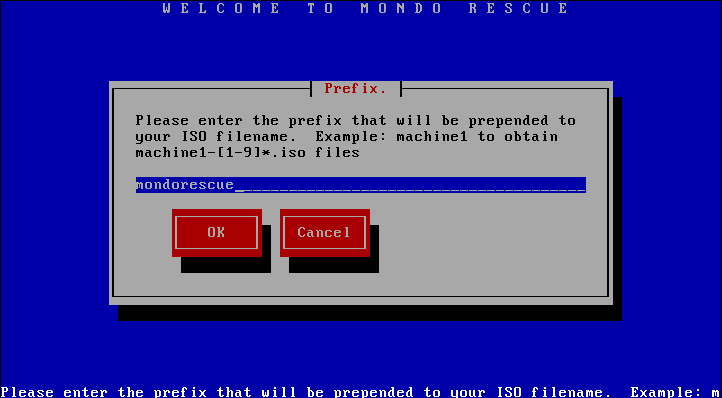 To restore you also have mondorestore. NOTE – For migrations in a production environment it’s good practice to use a temporary IP address on the machine to be backed up. This will mean users and services can’t connect to the server during the backup. NOTE – As the archival is done live on the system, you may want to stop all processes maintaining coherent information, such as RDBMS systems for which the operation could cause a synchronisation data issue. The weakest link of the free of charge OpenERP All-In-One for Linux is its dependence on the network and on launchpad.net repository, failing in case the Internet or Launchpad connection gets in trouble and requiring then a new deployment from scratch (with a fresh install of Ubuntu Linux included). Also, this All-In-One installer for Linux lasts longer than 40 minutes, downloading all the required python libraries and OpenERP source code. OpenERP All-In-One for Windows is easy-to-use and fast-to-deploy but is not update-able and not recommended for production either. On the other hand, the purchase of these inexpensive OpenERP Appliances will save you precious time and money by including OpenERP source code without the need of an Internet connection for downloading OpenERP. The full installation processends in less than 5 minutes, and can be deployed on virtual machines, in cloud computing infrastructures or installed in physical computers. The appliances also offer a professional well tuned and tested installation with ease of use, latest OpenERP updates with full logging, and guarantee of success without licence costs. Actually this is the number one choice for mission-critical computing (production), testing and demonstrations. ‘Add to cart’ buttons available here via e-junkie.com purchases. PayPal, credit card and debit card payments. The downloading should take around 9 minutes. Bear in mind that any download is only as fast as the slowest link in the network route, which is usually the buyer’s own ISP connection — e.g., a 500MB file would take several hours, and a 2GB file would take a day or two, to download to completion over a 256kbps basic residential DSL connection. Files are zipped for Simple File Verification. OpenERP branches included: openerp-server, openerp-web, openerp-client, addons, extra-addons. Apply latest OpenERP bug fixes available on Launchpad.net repository via openerp-update script in ‘openerp’ linux account. HP ProLiant MicroServer AMD Turion II N40L/2GB/250GB. Due to its lack of a DVD drive, this openerp appliance needs to be installed from USB, for which UNetbootin can be used. Deploy on the latest free of charge VMware player for windows (VMware Fusion on Mac OS X). VMware player default settings allow to reach the appliance from your windows browser, while virtualbox requires customization. VirtualBox and VMware Player can be installed on the same Windows system and run simultaneously. Desktop Appliances on VirtualBox or VMware Player: Set up full screen resolution, clipboard (copy/paste) support, and shared folders between the Virtual Machine and the Windows Host. Dual Monitor configuration: one monitor with a full screen Virtual Machine (openerpappliance), and the other monitor (i.e. laptop’s monitor) with the Windows host. How to reach the Virtual Machine from a windows host: Its default network configuration (NAT) will allow you to reach the virtual machine from your windows host. How to reach the Virtual Machine from the LAN: Set up a Bridged network adapter. A DHCP server available in the LAN is required, like i.e. your wireless router. Desktop Appliance: At least 700MB of VM memory required. NAT adapter, required to reach Internet from inside the Virtual Machine. This is the default adapter. Host-only adapter, required to reach the Virtual Machine from the windows host. It has to be added manually. Desktop Appliance: At least 700MB of VM memory required. Select 128MB of display memory. Desktop Appliance and virt-manager: Set up “vga 9MB” as default video adaptor before starting the KVM virtual machine. This fixes major display issues. A Senior IT professional with 11 years of experience in Public and Telecommunications sectors as Systems and Automation Engineer. He holds a Honours of Bachelor Computer Science degree from the University of the Basque Country (2000) in Donostia – San Sebastian, Spain. His career began in Ireland in the beginning of 2001, returning to Spain in 2002 after the dot-com bubble burst, and became contractor for final customers since then. He grew up in Bilbao area, and lives permanently in Madrid since late 2003. 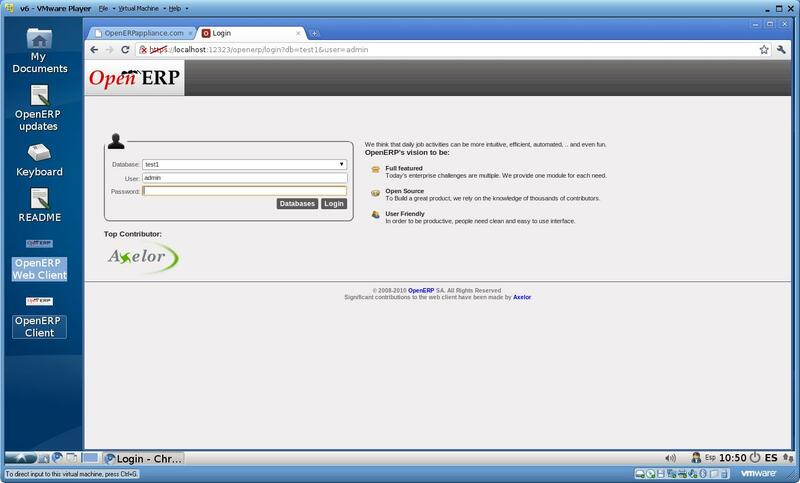 Buy OpenERP 5.0.12 Appliance Desktop ! Buy OpenERP 5.0.12 Appliance Server ! Buy OpenERP 5.0.12 Appliance Spain Desktop ! Buy OpenERP 5.0.11 Appliance Spain Server ! Buy OpenERP 6 trunk Appliance Desktop !